It’s that time of the year again when you’ll be wearing a coat every single day for at least three months, so choosing the right coat is essential! The main purpose of a jacket is to keep you warm but who said you can’t be practical and fashionable at the same time? Okay maybe research does show that women are better at multitasking than men but that’s nothing your coat/jacket can’t change. Wearing the right coat you can leave the best impressions and we suggest that if you’re willing to splurge on any clothing item this year it should be on a coat or jacket, because let’s face it, it’s the best way to cover up whatever mess you might have going on underneath! Based on autumn/winter trends of 2015, we have a complete guide for jackets and coats, keeping you warm and on trend this season. Keep it subtle- Subtle colours is the way to go this year, neutrals like tan, beige, grey and brown. This way allowing your outwear to tone down any bold statements you decide to make with what you wear underneath. Greens are also on trend this season but beware, we’re talking khaki- military green NOT kermit the frog green! Shearling Is In- Seen in the Michael Kors and Burberry Prorsum autumn/winter 2015 collections, a shearling jacket is a must this season. Synthetic or not, the jacket is cool,casual, comfy and of course promises warmth which we admit is the main point of a jacket! Worn with either a T-shirt, a Polo-neck or a buttoned shirt, we assure you, you’ll look charming whatever your combo. 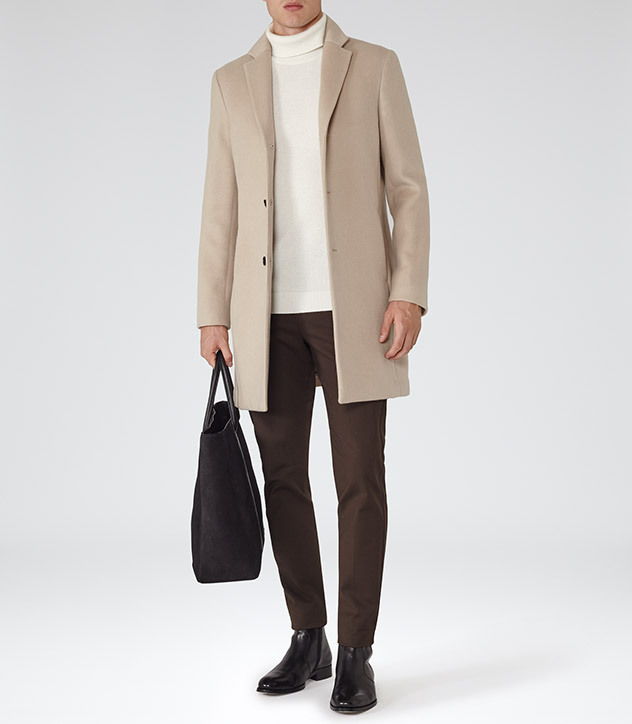 The Classic Fit Overcoat- Maybe you buy a new coat every year, but if you go for a classic cut coat you can recycle it and wear it each year (as long as it’s not worn out). Wool streamline overcoats is the best way to do this, funnel collars, notch, peak or shawl lapels will always look smart making you look the part. The most important thing with overcoats however is the fit! So make sure before you buy the coat, you consider all the layers that you will be wearing underneath it! Check Mate- Just because we said to keep it subtle, doesn’t mean you have to wear a block of colour, monochrome can be a safe option, though a check pattern can give you an instant edge this season.